What is a Big Adventure Activity? 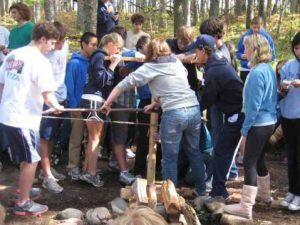 Like the Escape Room concept, a big adventure activity is a series of smaller initiatives, skills, and experiences, usually set up around a specific theme and often with a specific culminating task. These experiences are often journeys in the sense that the activity area can be large, with a number of stations or key locations where tasks are performed or resources are gathered. Often there is also a script or activity narrative that sets the stage for the overall activity. These scripts or narratives can get fairly involved at times and even include staff or others dressed in costumes and role playing certain characters. I can give some examples of this later. The total activity could last anywhere from a couple of hours to a full day. Why do activities like this? Add an additional adventure component to an existing experience that pulls everything together in a really great way. Be very clear and detailed on goals and outcomes. The story narratives and specific activities and activity tasks almost wrote themselves when we knew what cognitive and affective outcomes we wanted to achieve. In the beginning, I wrote these objectives out in detail just as I learned to do when I was student teaching. This helped a great deal. Pay attention to safety needs, supervision and logistics: Do you have lifeguards available if there is a water component? Do you have specific trained staff for the challenge course or other activities if they are incorporated? Also, since these activities are usually journeys in wild areas, what additional precautions need to be addressed–First aid, ticks or other related natural challenges, additional staff supervision in particular areas, etc. What additional skills, information or concepts could be incorporated (Some ideas below): I have seen primitive skills, maps and compass work, climbing skills, history and culture, math and related skills, natural history, etc. all brought into activities like this. They sky is really the limit here. What do you want participants to learn and practice? What creative ways could that be incorporated? 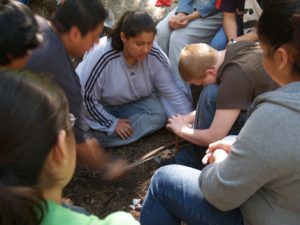 Know your skills: This may seem obvious but, if you are incorporating something like primitive fire making into your activity, make sure you have staff that know this skill and can teach, coach and supervise it. Practice skills in specific skills sessions before the adventure: We have found that it often works best to set aside specific time to teach and introduce specific activities, concepts and information that will be used in the big final adventure activity. Sometimes these sessions are set up as a rotation through a series of stations, sometimes participants are divided up and taught an individual skill. This will all depends on what your program outcomes and specific objectives are. Get creative: I will never forget a Star Wars themed experience that was set up a few years ago that incorporated the “Jedi Boat Master” at the waterfront dressed up as a Jedi with specific tasks and instructions for participants. 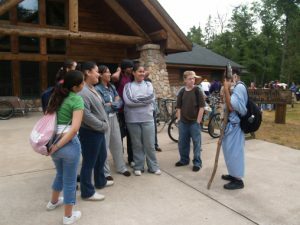 This same experience had other “guides” similarly dressed and with specific information and ways that they could be approached and addressed during the activity. As mentioned above, once you are clear on your outcomes and objectives, a theme and some of these other fun details may just write themselves. 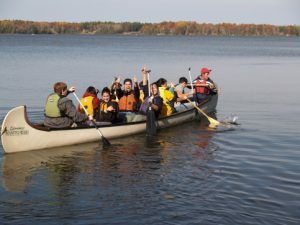 Experience Simulation Journey: This experience began from a specific goal of preparing participants who had very little wilderness experience, for an actual wilderness canoe trip. The simulation we designed, culminated in a camp set up in a safe location, canoes portaged to that campsite and hot chocolate prepared over a camp stove with the whole team singing a song that is sung as people paddle in from their wilderness trip (a Camp Manito-wish YMCA tradition). The journey required practice of all skills and incorporated learning about Leave No Trace ethics, safety information for wilderness travel, paddling and portaging canoes, etc. Experience Simulation Journey/Scavenger Hunt—City version: A long time Manito-wish staff person designed an experience using phone GPS, electronic tablets, etc. that took his corporate clients on a journey through a city. In this case the experience was set up as a scavenger hunt with elements of Amazing Race. Corporate Adventure: Participants were set up as a company with a task of (in this case) making a cup of natural tea and designing a marketing campaign and pitch, logos, etc. The last task involved a presentation to a “board” in an attempt to sell the product. “Economy”-Occasionally one of the included challenges in a particular adventure involves “buying” necessary resources and making choices and decisions as a group about priorities. Often these economies are set up with particular outcomes in mind. In one example, matches are REALLY expensive, but a primitive fire device is cheap. Groups are given a total “budget” amount and items for purchase are set out on a table. Items may include specific task instructions or other key things. There is a lot of room for fun and creativity here. Theme Variation: Often themes and the resulting script, etc. change based on popular events, movies, etc. There are times though when the theme is dictated by particular outcomes. In several instances we wanted to build an experience that included participants interacting with another culture or world view. In these situations we were careful to construct something new and not simply attempt to adapt a stereotype. There are challenges here, but it can work. Using Technology: Bringing tablets and smart phones into an experience is something new that could build on and enhance an experience. I already mentioned a program activity that was used for a corporate group (see above). I have also seen very elaborate set ups that utilized GPS and other technologies to convey information on the script, confirm locations of key resources, assisted participants in positive ID of natural materials needed, etc. I think more work needs to be done in this area, but the possibilities do exist and there are programs using technology very creatively. Over the years we have heard of many other creative ways that industry peers have taken these ideas and added their own ideas. Let us know what you come up with. Join us on Pinterest Manito-wish Leadership for articles, resources, ideas and activities. Something added every day. Please send along your success stories. We’d love to feature your program in future posts. Contact me directly at: mark.zanoni@manito-wish.org. We’d also love to hear your feedback and ideas. Thanks so much! This entry was posted in General Info, Leadership, News, Training.